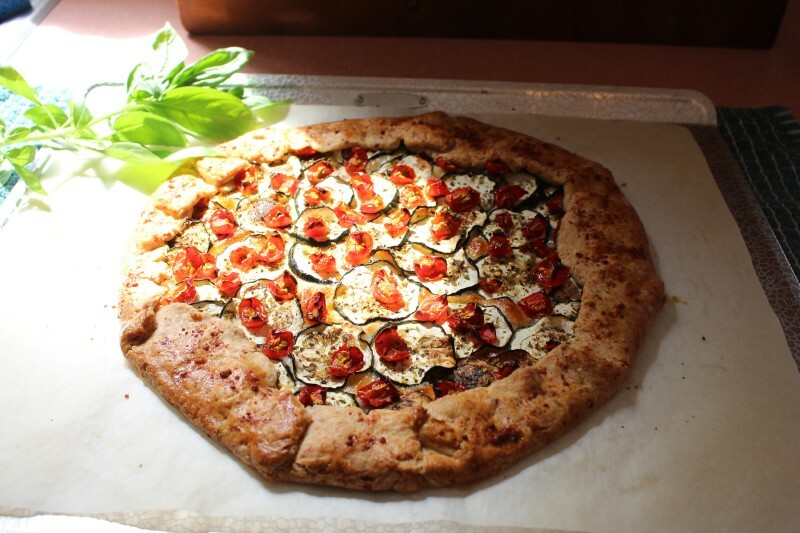 Zucchini Tomato Galette is one of my favorite tarts in the summer time. 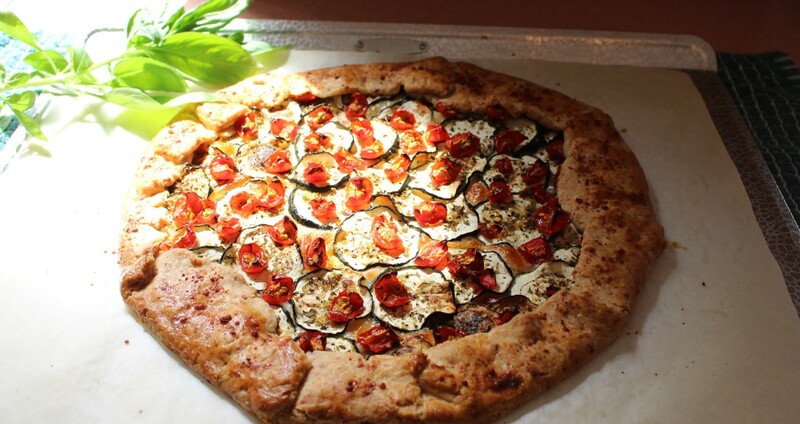 If I’m lucky, I have just pulled both the zucchini and tomatoes from the garden to make this tart. Very simple. Very fresh. Very seasonal. Baking to me is meditation. There is a task at hand to focus on, but I also notice my wandering mind. The thoughts are like the ticker tape at the bottom of my screen. They are there, but I am able to keep coming back to what I am doing. It is not perfection by any means- nor am I looking for that- but it is doing the task that is so calming. The greatest thing baking has taught me is not to freak out…! Take a deep breath and feel where you are. It’s so EASY to react, but instead, pause, breathe and continue. There is also the satisfaction of creating- regardless of the result. Being in the moment and enjoying the task. And… this is delicious! p.s. Don’t let the dough scare you! It is a very forgiving dough. And since it’s a free form tart, any shape is perfect! If you don’t have pastry flour, use All Purpose Flour. It will be a firmer dough, but will still work out fine. I hope you enjoy! In mixer or by hand, blend the dry ingredients. Mix in butter until crumbly. Slowly add water, 1 Tbl at a time, until mixture comes together and everything is moist. Form the dough into a disk, wrap in plastic wrap, and refrigerate for 30 min. Preheat oven to 425 degrees. Line 2 large sheet pans with parchment paper. 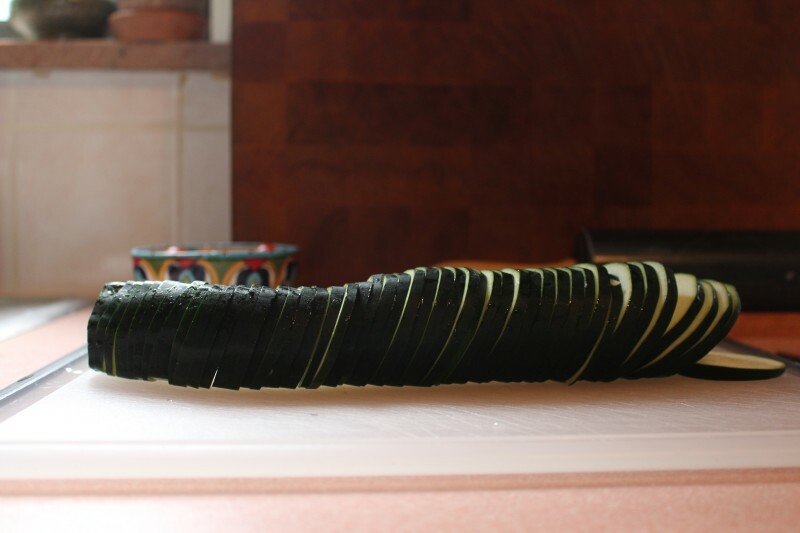 Slice zucchini into 1/4″ thick slices. Quarter the tomatoes. Place them separately on the sheet pans. 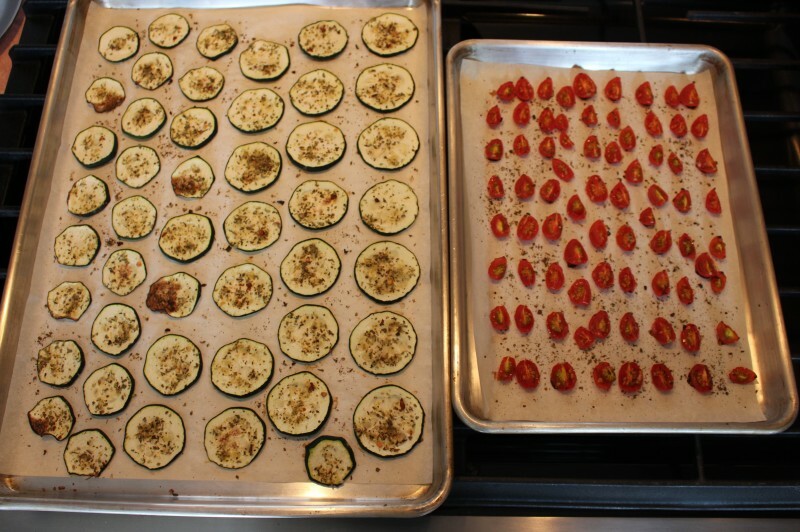 Bake until the vegetables are dried a little, about 15 min for the zucchini and 10 for the tomatoes. Allow to cool before assembling the galette. On a lightly floured surface, roll the dough to a 12-14″ circle. Transfer to a parchment lined sheet pan. 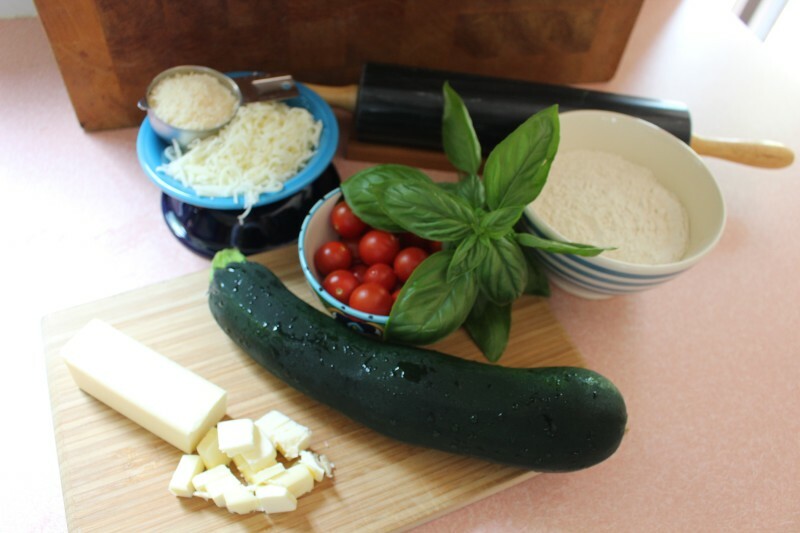 Spread the mozzarella cheese over the crust, leaving a 2″ border. Sprinkle the Parmesan cheese on top. 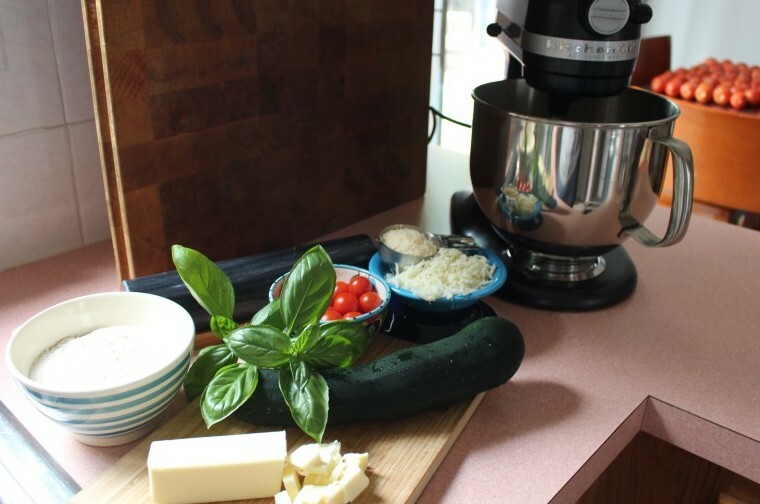 Lay the slices of zucchini on the cheese, overlapping slightly, to make a pinwheel design. Scatter the tomatoes on top. Fold the edges of dough over the filling. Brush the edges of dough with the egg wash, and sprinkle Parmesan cheese over the egg wash. Bake for about 25-30 min. Allow 10 min to cool before serving. Finish with chopped basil and a drizzle of olive oil.